In 1951 composer Arnold Schoenberg dictated from his Brentwood home a letter to Dial Records to protest in the most abusive language he could muster the company's recent release of his "Ode to Napoleon" using a female rather than a male reciter. "You are not only a bugger," Schoenberg irascibly bellowed, "not only a man who discards an artist's wishes" but one who "does not care to keep a contract." 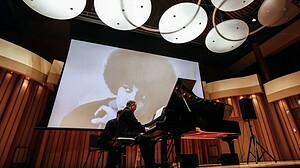 When pianist Nicolas Hodges cleverly introduced his stupendous Monday Evening Concerts recital at Zipper Concert Hall with a video of Peter Ablinger's installation work, "A Letter From Schoenberg," which accompanies Schoenberg's computer-altered voice (taken from a surviving Dictaphone recording) on player piano, it was hilarious. Times have certainly changed in the last six decades. But it was also disconcerting, because times have changed maybe even more over the last decade. Ablinger's added piano part mimics with new emphases and distortions a machine voice that, compared with Siri, Alexa or the other latest advances in artificial intelligence, is already as archaic as HAL in "2001: A Space Odyssey." In the recital that followed, Hodges, a British pianist who is based in Germany and is one of the leading performers of the advanced European music we seldom encounter anymore on this side of the Atlantic, did little to clarify the matter of music, voice and meaning. Instead, he made seemingly unintelligible music speak for itself. He is a pianist with a flabbergasting technique and instantly engaging musicality. It was a brilliant recital. In selections from Ablinger's "Voices and Piano," Hodges provided pianistic comment to recordings of the voices of notable political or artistic figures. Angela Davis' voice took on a lyrical, swinging quality. Lech Walesa's Polish was choppy. Iranian poet Forough Farrokhzad's reading of her Arabic verse was lush and highly decorated. The L.A. radio host and composer Bonnie Barnett had a booming presence. Understanding the words ultimately became unimportant; it was the projection that gave the pronouncements meaning. And thus, this was an evening of transcending syntax in the effort to make the inaccessible accessible. James Clarke addressed that issue directly in his program note for "Untitled No. 5" by saying that he avoids giving his pieces titles or providing descriptions to guide the listener. He trusts an audience's powers of perception to deal with the score. My sense of his piece was of low notes and midrange sonorous chords opening up, spilling their insides like buds releasing seeds dancing into the wind, with a harmonically (in some way) filigrees in Hodges' dancing right hand. Whatever Clarke had in mind, his piece gave great pleasure in freely allowing an imaginative response. When it came to Brian Ferneyhough's obscurely complex "Lemma-Icon-Epigram," Hodges' sheer determinacy was what proved gripping in its own right. You sense there may be language underneath as cogent as Davis' "We will have to destroy the American capitalist system," it's just that the voice is taken away. Rebecca Saunders, on the other hand, describes her "Mirror, mirror on the wall" as coming from imagining sounds and noises so tactile, the British composer writes in her program note, that she feels she could hold them in her hands. Finally for the world premiere of Rolf Riehm's "Ciao, carrissimo Claudio, or Die Steel Drums de San Marco," his impressions of Venice became muddled by the voices from the past (Monteverdi's). Riehm layered a clashing keyboard over electronic atmospherics, and nothing once more was real, altering perception of the past or place. And, pace Schoenberg, that's what happens when you actually do regard, to Hodges' almost superhuman degree, an artist's wishes.